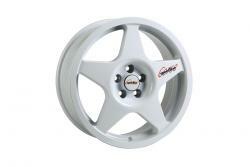 The Speedline Corse Challenge wheel is a low pressure cast aluminium and a highly recognisable Speedline 5 spoke classic design. Being both durable and lightweight the Comp 2 wheel is ideal for motorsport inspired road cars or is equally at home being used on the race track or for tarmac rally use. If you like your wheels to be simple and elegant, with classic motorsport styling, it doesn't come much closer than the Challenge. Another design classic, inspired from the world of rally. Like all Speedline aftermarket wheels, produced using the most advanced low pressure casting technology, heat treated and finished to perfection. Wide range of fitments and colour options available.